Manchester United won yet again under Ole Gunnar Solskjaer yesterday, with Marcus Rashford scoring a superb winner away to Tottenham. 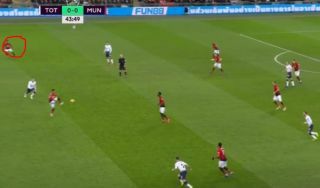 As you can see in the image above, the England international cleverly anticipated the pass from Paul Pogba before United had even touched the ball. As explained in the tweet below, Rashford actually starts his run up field before Jesse Lingard even applies the touch down to Pogba in midfield. While this may seem simple, it’s the kind of thing United just weren’t doing under Jose Mourinho, with their play so often static and slow, with Rashford one of those to suffer under the Portuguese’s conservative management. Here, however, he was in full flow, and fans absolutely loved it – hailing the youngster’s ‘world class play’ and dubbing it ‘Ole ball’, among other things. With Solskjaer’s latest win coming over a big team like Tottenham, the Norwegian seems to have shown he’s the real deal, having previously only had a fairly easy run of fixtures, beating the likes of Cardiff City, Huddersfield and Newcastle. And be in no doubt- Pogba’s seen him already. World class play. Rashford believes in Pogba !! Well, I think this picture sum up what Ole did to his attacker. Now they had better off the ball movement. This condition will make Pogba launch the through ball behind defender and Rashford is ready to shoot. Things that really miss in van Gaal and Mourinho side.